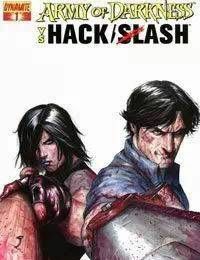 After the events of the HACK/SLASH series, Cassie Hack is doing her best to live a normal life. But a Deadite attack forces Cassie back into action and this time, shes not alone! Meet Cassies new partner: Ashley J. Williams! Can the pair keep from killing each other long enough to quest for the stolen pages from the Book of the Dead? Will Ash get some sugar? Or will Cassie make him kiss it? Its the horror mash-up that fans demanded!